In an effort to clarify some of the details that were left dangling in Part 1, I visited City Hall and spoke with Bradley Birge, the city’s Administrator for Planning and Economic Development, who’s overseeing the project. He walked me through the trail map and provided information that essentially confirmed most of what was written in Part 1. 1. The Village of Ballston Spa Water Reservation. There’s a large parcel behind the northeast corner of Rowland Street and Geyser Road that’s owned by the village and includes a reservoir, which is actually located in the Town of Milton. Mayor John Romano of Ballston Spa expressed reservations because he thought the trail would lead to people swimming in the reservoir, with the risk of drowning. What he failed to mention is that the reservoir is already very accessible via Baker Road, which comes off Geyser Road. The new trail wouldn’t bring anyone any closer or provide easier access, since there are already dense woods and numerous private properties on the Geyser Road side opposite the reservoir. As I suggested earlier, the real issue with the village seems to be a stingy financial offer (as reported by the mayor), as well as insulting behavior towards the mayor and the village by the city’s representative. Since money talks, one would expect to see a settlement based on a better offer and, hopefully, an apology. 2. 159 Geyser Road. Tim Harrington, who lives at that address, made an emotional statement before the City Council’s August 1st meeting to protest possible confiscation of this land. However, the city has no need to acquire property from this parcel because the existing right-of-way is already wide enough to accommodate the trail. While the trail will still run in front of his house, it will be on land already owned by the county. At the August 15th City Council meeting, Dave Morris suggested that Mr. Harrington’s well-head and flagpole were in the way of the path, but lacking a survey of the property, there’s no immediate way to confirm this. Of course, if that is the case, then Mr. Harrington has been using public land as if it were his own and may have other problems to resolve. In fairness, this is not uncommon in areas where there are no sidewalks to begin with and the boundaries are not clearly marked. 3. 111 Geyser Road. This is Jack Pompay’s property, the one with the mature shrubs. It turns out that some of the shrubs are situated on public land, but moving all of them back at city expense is in the budget. Additional funds are also available to replace any shrubs that don’t survive. Mr. Pompay is party to a law suit, apparently instigated and funded by the Saratoga Spring Water Company, so the final resolution may end up with the courts. 4. 119 Geyser Road. As with the property at 159 Geyser, the right-of-way is already wide enough for the trail, which will go in front of the existing fence. The fence and other landscaping features will be unaffected, so no additional land or adjustments are required. 5. The Geyser Road Elementary School. The city school district has agreed to cede land required for the trail at no cost. 6. The same is true of Geyser Park and neighboring Veterans Memorial Park, which are already in the public domain. 7. Munter Land Holdings. The Munter family has made a generous donation of their frontage to the project. 8. Van Hall Holdings negotiated a sale of their frontage, so no further action is needed. 9. 11 Geyser Road. The is the property of the Saratoga Spring Water Company. In 2015, they came before the planning board to request permission to expand their facility and, as part of the variance granted, they tacitly agreed to allow the trail to run along the road in front of their plant. At my request, Mr. Birge kindly provided copies of both the variance maps submitted by the company and the minutes from the Planning Board meeting of April 22, 2015, both of which are no longer linked from the city website (they’ve been uploaded to one of my personal sites). The trail is on the owner’s variance map, as well as on the front of their variance proposal, so why have they suddenly decided to sue to stop the project or have the trail rerouted? While I still don’t have an answer, I speculated earlier that it’s politically motivated and so far haven’t heard a reason to think otherwise. Any of the other properties on the road that were not specifically mentioned are in the same situation as ones detailed above — the public right-of-way is already wide enough for the trail or the land is already in the public domain. One point that does not have an elegant resolution is what happens at the Milton Town Line, where the trail will officially end, as shown in the photo, looking west, below. 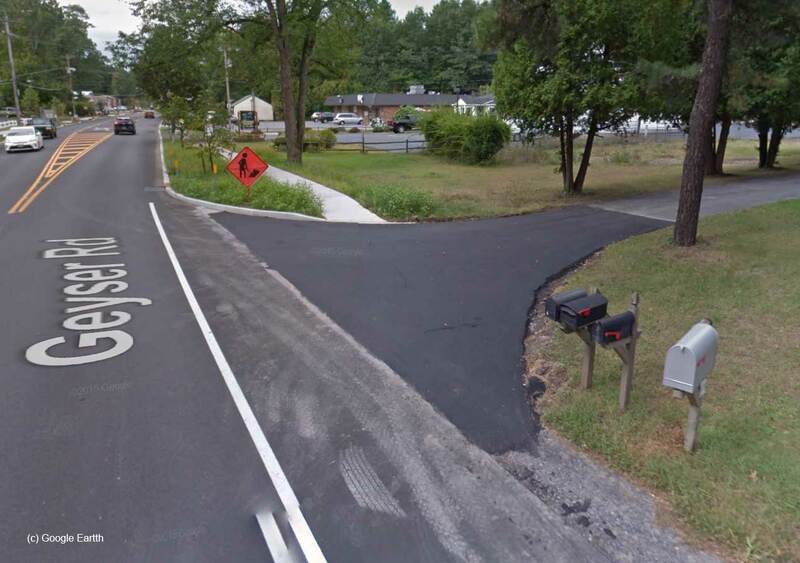 The trail would terminate in back of the mailboxes on the right leaving people to continue on their way via the sidewalk on the other side of the driveway. The town line is actually another 150 feet to the west, beyond the driveway, but that’s academic. While pedestrians would still have a sidewalk on both sides of the road, bike riders would be dumped onto Geyser Road, itself, along with all of its traffic. At that point, it would be up to the Town of Milton to continue the trail or create a bike lane. But let’s step back and consider the Big Picture. The trail is really a spur off the Saratoga Springs Greenbelt Plan. In other words, its initial intent is not to connect trail networks at each end, only at the Spa Park end. 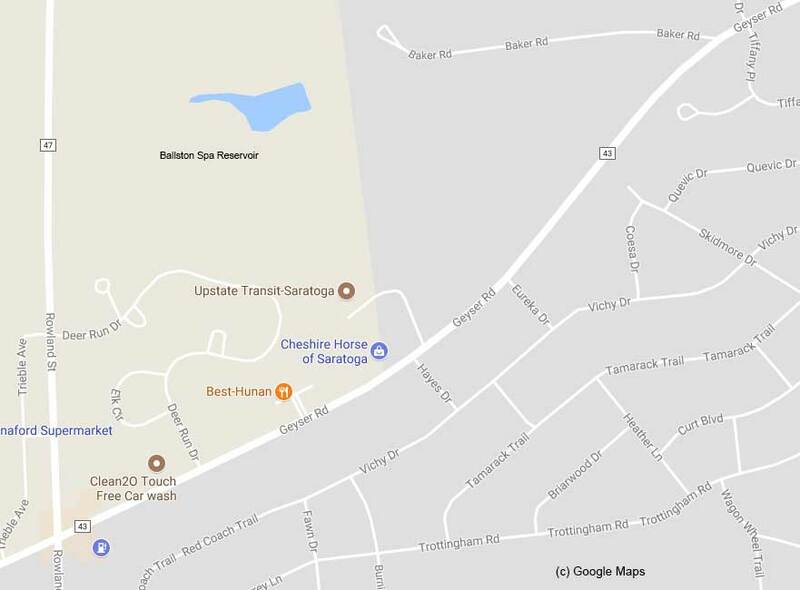 In the long run, the Town of Milton may build connections on the western end, but it’s immediate purpose is for easier access from the Geyser Road developments to downtown Saratoga Springs. Wrapping up, at the August 15th City Council meeting, two residents of Geyser Crest spoke in favor of the proposed route and one against. One of pro speakers, Lurana McCarron, opposed the alternate routes on the grounds that joggers and walkers have been known to be attacked on woodland trails, but that can happen on city streets, as well, and isn’t a very strong argument. That’s to say nothing of the many existing woodland trails in this area where I can’t recall any sort of dangerous activity being reported. Opposing the proposal, again, Dave Morris emphasized the perceived danger of a distracted driver losing control of their vehicle and careening onto the trail, killing or maiming its users. In fact, this can happen on any road in the city or suburbs, including the Geyser Road developments which lack sidewalks and where everyone on foot or bicycle is forced into the pavement. It’s the risk you take every day when you step out of your house. While he’d like to see bollards or a fence between the path and the road, they’re not in the budget. After the verbal comments, additional written and eMailed materials from the public were entered into the record for further consideration. Then the mayor declared that the final vote will take place at a future city council meeting, possibly as early as September 5th. As for the court challenges, look for updates as they wend their way through the system. Whether walking, running, biking or driving, have a safe Labor Day weekend.